I love finding activities that help kids to be active. Gross motor activities are so important to not only help preschoolers develop coordination and balance, but also to focus their energy into movement. And when they can use their imaginations as well it’s even better! 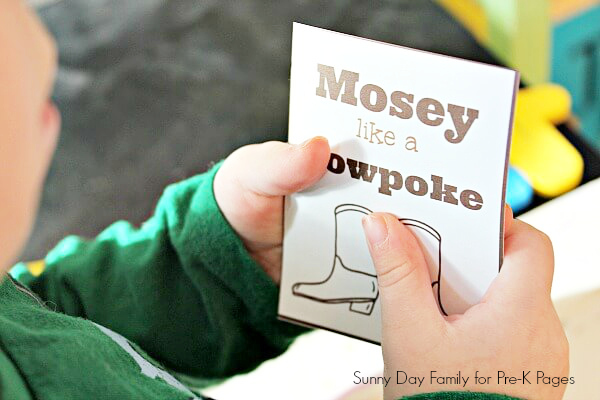 This fun western or cowboy theme activity will have your little buckaroos hooting and hollering for more! My twin boys love to play cowboy, and their play inspired this western themed gross motor activity. It’s a really simple way to get preschoolers moving and incorporates a number of physical skills. This activity also encourages them to practice taking turns while thinking creatively. It’s a great addition to a cowboy or western theme unit either as a way to give kids an active outlet after a western theme story time or as part of cowboy theme dramatic play. The set up for this activity could not be easier. First, you’ll need to print a set of Cowboy Cards on card stock or heavy paper. Cut along the lines to create 8 cards. If you have a larger group you can simply print and cut out additional sets as needed. Download your Cowboy Cards here. 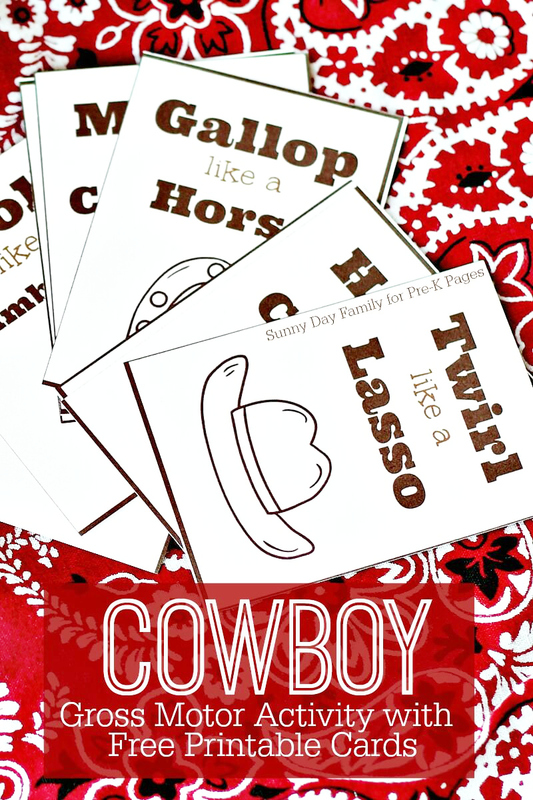 Then, after reading a cowboy themed storybook (I’m a big fan of The Gingerbread Cowboy by Janet Squires), invite each child to choose a card – make it extra fun by choosing the card out of a cowboy hat! 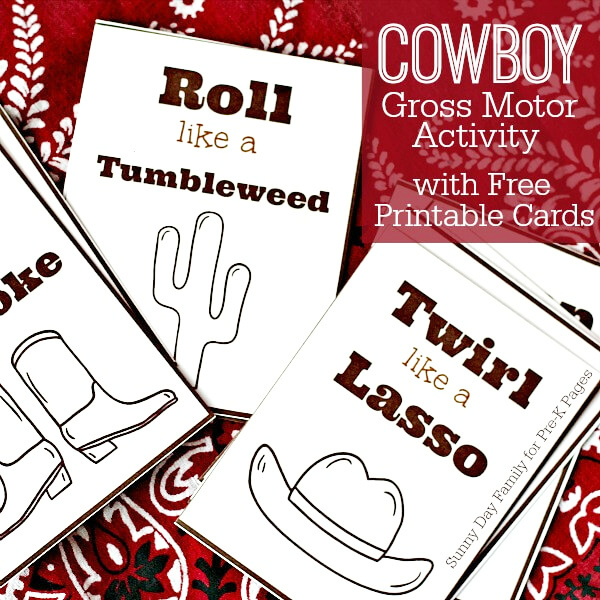 Invite children to act out the cowboy themed movement on the card. They may have to Roll like a Tumbleweed, Gallop like a Horse, or even Howl like a Coyote! You can also use the Cowboy Cards to encourage discussion. 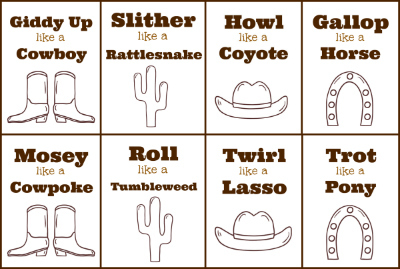 For example, after choosing the Slither like a Rattlesnake card, you can talk about why snakes move the way they do. Do they have feet? Do they have bones? Other extension questions could be: Why do coyotes howl? What exactly is a Tumbleweed made from? There are so many opportunities to encourage children’s natural curiosity and to help them to explore these ideas. You can also include a bit of dramatic play by having the children dress up for this activity – cowboy hats and bandanas are easy props to bring a little more excitement to this fun western game. BIO: Laura is a mom to twin boys and the author of Sunny Day Family, where she shares fun activities and easy organizing tips. Find all her free printables here. Connect with her on Facebook, Pinterest, Instagram, and Twitter. Follow my Western Theme Pinterest Board for more great ideas! This is an awesome site. I love it! I am so happy to have found it just by browsing the internet.